Citation Information: J Clin Invest. 2005;115(2):468-475. https://doi.org/10.1172/JCI22720. Tamm-Horsfall glycoprotein (THP) is expressed exclusively in the kidney and constitutes the most abundant protein in mammalian urine. A critical role for THP in antibacterial host defense and inflammatory disorders of the urogenital tract has been suggested. We demonstrate that THP activates myeloid DCs via Toll-like receptor-4 (TLR4) to acquire a fully mature DC phenotype. THP triggers typical TLR signaling, culminating in activation of NF-κB. Bone marrow–derived macrophages from TLR4- and MyD88-deficient mice were nonresponsive to THP in contrast to those from TLR2- and TLR9-deficient mice. In vivo THP-driven TNF-α production was evident in WT but not in Tlr4–/– mice. Importantly, generation of THP-specific Abs consistently detectable in urinary tract inflammation was completely blunted in Tlr4–/– mice. These data show that THP is a regulatory factor of innate and adaptive immunity and therefore could have significant impact on host immunity in the urinary tract. THP activates professional APCs. 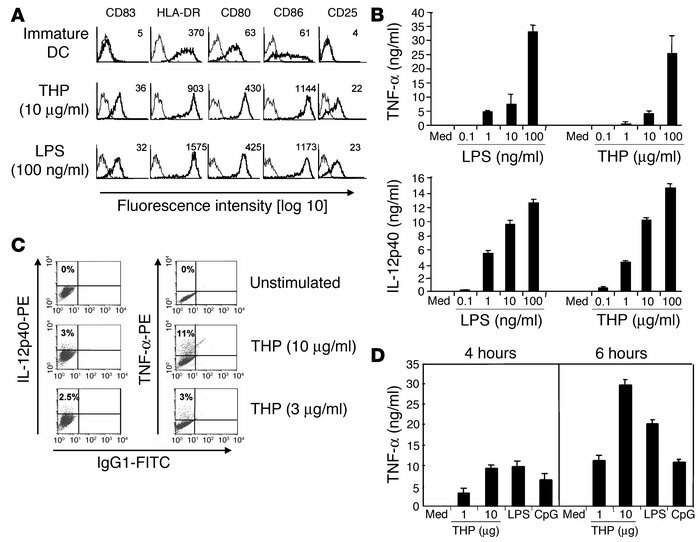 (A) Immature monocyte-derived human DCs were stimulated with THP or LPS. Profiles with fine lines represent staining patterns with an isotype-matched control Ab, and profiles with bold lines represent staining with mAb of the indicated specificity. Data are representative of 5 independent experiments. Numbers indicate mean fluorescence intensity of specific Ab staining. (B) Immature human DCs were stimulated with different concentrations of THP or LPS. Cell-free supernatants were collected 18 hours after addition of THP or LPS and were analyzed by ELISA. Med, medium control. (C) Intracellular cytokines were stained in human DCs 18 hours after stimulation and then analyzed by FACS. Results are representative of 3 independent experiments. (D) Mouse RAW264.7 macrophages were exposed to THP, LPS, and CpG for the indicated time periods. Cell-free supernatants were analyzed for TNF-α by ELISA. Similar results were obtained in 3 other independent experiments and data are expressed as means ± SD of triplicate cultures in a representative experiment.